With Vasiliy Lomachenko, Oleksandr Usyk, and Oleksandr Gvozdyk relishing in the success of fighters from the Ukraine that have become world titleholders, Serhii Bohachuk could be the next big thing from the Eastern European country. After a stellar 2018, one that saw him score six knockout victories, Bohachuk returns to action Sunday night in hopes of picking up where he left off. The unbeaten junior middleweight will square off against Cleotis Pendarvis at The Avalon in Hollywood, California. 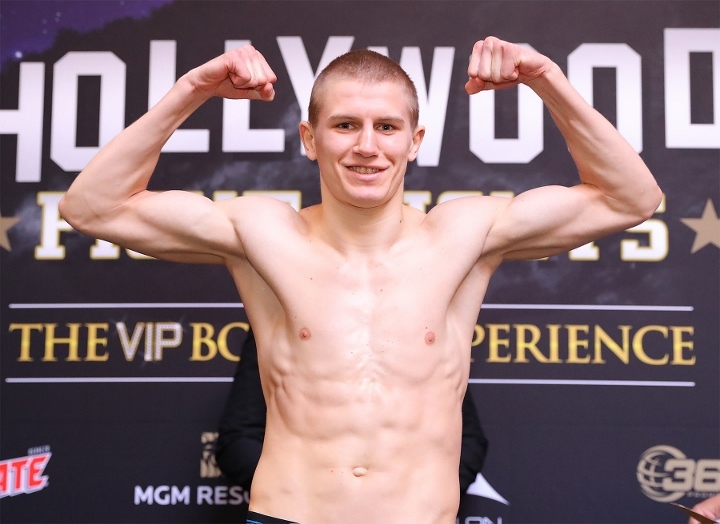 The fight will headline a nine-bout 360 Promotions card, which will be streamed in its entirety on 360Promotions. .
At Saturday’s weigh-in, Bohachuk weighed 155.6 pounds. Pendarvis weighed in at 160 pounds. Bohachuk (12-0, 12 knockouts) last fought on Dec. 8 in Carson, California, breaking down Carlos Garcia Hernandez before knocking him out in round five. Bohachuk, who was born and raised in Vinitza, in the Ukraine, now lives and trains in Big Bear Lake, California. Promoter Tom Loeffler believes the 23-year-old Bohachuk has yet to hit his ceiling. Pendarvis (21-4-2, 9 KOs) has not fought in almost two years. The 32-year-old Pendarvis has won his last four bouts since losing by knockout to then-unbeaten junior welterweight Dierry Jean. In the co-feature, unbeaten light heavyweight Ali Akhmedov will face Mike Guy (9-3-1, 5 KOs) in an eight-round bout. Akhmedov (13-0, 10 KOs), who is originally from Kazakhstan and now resides in Henderson, Nevada, knocked out Jovany Gomez in the opening round of his last bout on Oct. 11. Akhmedov has won six of his last seven bouts by knockout. Guy has not fought since losing a close unanimous decision to unbeaten Junior Younan in July of 2017. Middleweight Meiirim Nursultanov (10-0, 8 KOs), who is also from Kazakhstan, will square off against gatekeeper Luis Hernandez (16-7, 9 KOs) of Puerto Rico in a four-round bout. Nursultanov is managed by Egis Klimas and trains in Oxnard. Hard-hitting lightweight Mario Ramos (7-0, 7 KOs) of San Diego will face Arnulfo Becerra (7-1, 5 KOs) in a six-round bout. Junior welterweight Devon Lee (6-0, 6 KOs) will square off against veteran Daniel Perales (10-15-2, 5 KOs) of Mexico in a five-round bout. Lee resides in the Los Angeles area. Three more fights will round out the card.